Like the story of Rahu & Ketu, this story of Lord Ayyappa too begins after Samudra Manthan. When Lord Shiva heard praises of the enchanting beauty of Mohini, the female form of Lord Vishnu, he expressed the desire to see it by himself. When he saw Mohini, Lord Shiva was overcome with passion and united with her. This union of Hari and Hara was called HariHaraMurti and from this was born Lord Ayyappa or Dharmashastha or Hariharasuthan (son of Hari and Hara). Lord Ayyappa spent a few years of his childhood in Kailasa under the loving care of Shiva, Parvati and his brothers Ganesha and Subramanya (Karthikeya) and sister Bhadhrakali. Under the supervision of Shiva and Parvati, Ayyappa attained mastery of Vedas, Upanishads, Shastras and artillery. One day, Lord Shiva explained to him the purpose of his life. The Asura (demon) king Mahishasura, son of Asura Rambha, was blessed with invulnerability to all men and hence to end his terror and torture the Gods sent Goddess Durga or Shakthi. 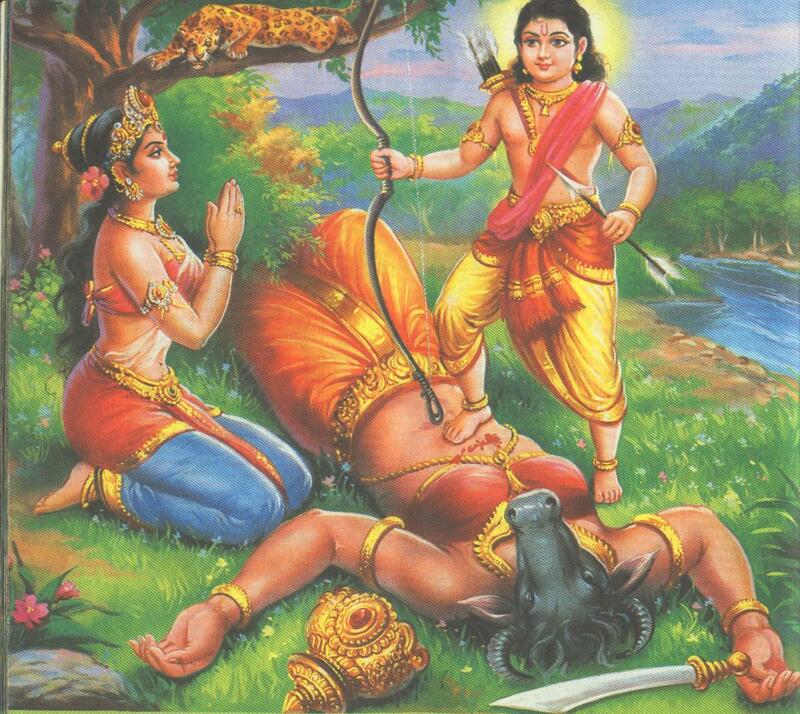 Durga fought fiercely and killed him. This enraged his cousin sister Mahishi (daughter of Karambaasura). She sought revenge against the Gods who participated in the death of her brother. Mahishi was the cursed wife of Dattatreya (son of the sage Atri and his wife Anasuya), Leeladevi (daughter of sage Galava). Mahishi (she-buffalo) pleased Lord Brahma, the creator. She asked for the boon of invulnerability but Brahma told her that it was impossible. A cunning Mahishi then asked him for a boon that none other than the son of Lord Shiva and Vishnu shall be able to kill her. She knew it was absolutely impossible for two men to have a child as it was against the order of nature. Lord Brahma granted her the boon to rule the Universe and being invulnerable to all men except the son of Hari (Vishnu) and Hara (Shiva) who would serve as human being on earth for twelve years before he could kill her. She thought that now she was unconquerable and hence started defeating everyone and conquering the three worlds. She tortured and defeated men (manushya on earth), demons (asuras in paataal/hell) and demi-gods (devas in swarg/heaven). Lord Shiva tells Ayyappa that it was time for him to be born as a boy on earth and serve humanity for twelve years before fulfilling the purpose of his birth, Mahishi’s destruction. This was the purpose of the divine union of Lord Shiva and Lord Vishnu. The king and queen of Pandalam in Kerala were childless and extremely sad about it. They were both highly religious and ardent followers of Lord Shiva. One day, the king along with his army reached the banks of river Pamba for hunting. This is where he finds Lord Ayyappa as a wailing baby boy with a gem around his neck. He was thus named, Manikandan (in Sanskrit, mani means gem and kanda means neck). King Rajashekhara of Pandya Dynasty adopts Manikandan and takes him to the palace. The king and queen raise Manikandan as their own child. After two years, the king and queen are blessed with a baby boy. They name him Rajarajan. Both the boys grew up together in the loving atmosphere of the kingdom. Manikandan goes to Gurukula and masters all arts and sciences. He blesses the guru’s vision and speech impaired son with sight and speech. The Guru realizes that Manikandan was a divine form of Dharmashastha. Manikandan requests the Guru to keep this information as a secret for some more time. The Guru obliges. When Manikandan is twelve years old, the king decides to appoint Manikandan as the crown prince. His prime minister was unhappy that the natural heir Rajarajan who was the real son of the king is not being appointed as the crown prince. He misguides the queen and makes her agree to get rid of Manikandan. As per plan, the prime minister poisons Manikandan and applies magic and witchcraft. Manikandan becomes terribly sick and down with deadly rashes all over his body. He could not be cured by the royal physician in spite of his best efforts. This is when Lord Shiva comes in the form of a sage and cures Manikandan. The queen now acts of having a terrible headache which no physician or sage is able to cure. The prime minister threatens the royal physician and makes him say that nothing but the milk of a tigress is required for curing the queen. But no one was ready to go to the forest and milk the tigress (puli in Malayalam). Manikandan realizes that it was time for the fulfillment of the purpose of his divine avatar. He convinces the king that it is his duty to get the milk to cure his mother and hence he should be allowed to go to the forest. He leaves the kingdom with his bow and arrows. Finding him alone in the forest, devas and sages appear in front of him and apprise him of the situation of Devaloka (heaven) where Mahishi had conquered Indra’s throne. Indra requests Manikandan to fight and kill Mahishi and save Devas and Devaloka. During this time, Lord Shiva had sent Mahisha (cursed form of Dattatreya) to lure Mahishi and bring her to earth. Mahishi was so charmed that she forgot everything about the revenge and blindly followed Mahisha to earth. After a long and fierce battle Maikandan caught hold of her horns and killed her. Mahishi fell dead on the banks of the river Alasa (Azhutha) in Kerala. Manikandan jumps onto Mahishi’s dead body and performs a dance form like Tandava. The touch of Manikandan redeemed Mahishi from the curse and Leela emerged. She prayed Manikandan and asked him to take her as his consort. The Lord declined her request since he was a bramhachari (a celibate) for the purpose of Dharma Shasan, but agreed that she being the avatar of Saraswati, Laxmi and Parvathi combined, would be worshipped at a special shrine next to him. From then onwards she was known as Malikapurathamma. It is said that Ayyappa had promised to marry Malikapurathamma in the season when there are no kanni-ayyappans (first-timers) to the temple. Mallikapurathamma is said to be waiting eternally for that season. Indra and the devas disguised as the tiger and his tigresses. Manikandan climbed onto the tiger and rode to Pandalam. When people saw Manikandan return with a group of tigers instead of just the milk, they bowed to him and prayed. The queen and the prime minister realized that Manikandan was no ordinary boy and sought forgiveness for their mistakes. After fulfilling the purpose of his avatar, Lord Ayyapan agreed to the wishes of his foster father, King Rajasekharan of Pandalam, and agreed to remain at the Holy Shrine of Sabarimala for the purpose of Dharmashasan in the world. Thus two adjacent temples were made by the King at Sabarimala, one for Shree Dharmasastha and the other for Malikapurathamma. Parashurama carved the figure of Lord Ayyappa and installed it on the day of Makarasankranthi. Sabarimala is situated inside the dense forests of Periyar Tiger Reserve. ‘Sabarimala’ is derived from Sabari, a devotee of Sri Ram. The previous name of the place was Mathangamala, named after the sage Mathanga. After Sri Ram and Sabari met there, the place came to be called Sabari’s mala (mountain in Malayalam), and thus Sabarimala. The important message given at the temple is, Tat Tvam Asi. The ultimate knowledge that each individual is a God to himself/herself. Tat Tvam Asi in Sanskrit means “That is you”. This is why the pilgrims call each other Swami. I have always wondered why Lord Ayyappa is not known by my North-Indian friends when all the other related stories like Samudra Manthan, Rahu & Ketu and Mahishi vadham are similar. This is when I read another story online which said the union of Shiva and Vishnu, the foetus, was sent to monkey queen Anjana’s womb because it was against the order of nature for two men to have a child. The child thus born was Hanuman. This is why Hanuman is also said to be Shiva’s child. I have no idea which one is the real story but the one common thing between Ayyappa and Hanuman is that they are both brahmacharis. Irrespective of the authenticity, both the stories are equally interesting. Do share any variations that you are aware of. The History – Sabarimala-The pilgrimage is a symbol of love, equality ..